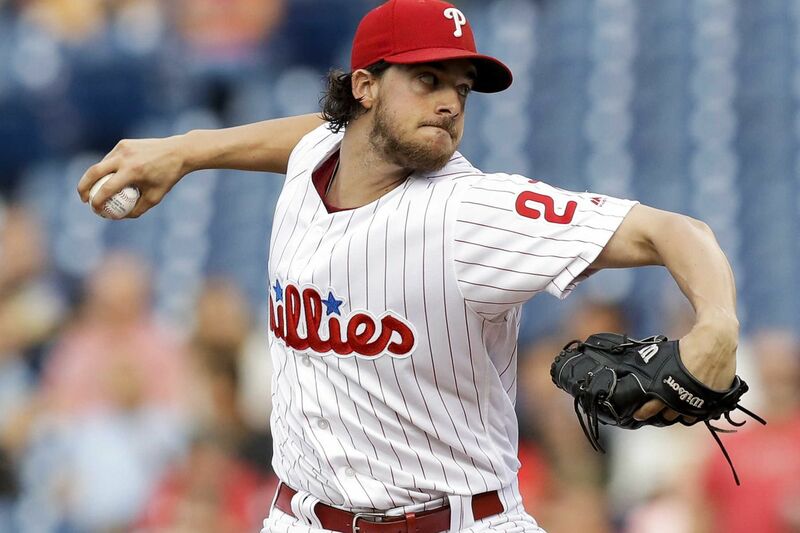 Aaron Nola could be headed for an arbitration hearing with the Phillies. YONG KIM/Staff Photographer. Aaron Nola and the Phillies might be headed to trial. The Phillies reached agreement on 2019 salaries with all but one of their arbitration-eligible players before Friday’s deadline. Nola was the holdout, and with the sides now having exchanged figures, a source said it’s unclear whether talks will continue before a hearing date next month. Nola is seeking a $6.75 million salary, while the Phillies are offering $4.5 million. It’s also more likely at this point that the Phillies will sign their 25-year-old ace for one year rather than working out a multiyear agreement. Nola, who had a breakout season last year and finished third in the National League Cy Young Award voting, isn’t eligible for free agency until after the 2021 season. The Phillies did strike one-year deals with second baseman Cesar Hernandez ($7.75 million), third baseman Maikel Franco ($5.2 million), right-hander Vince Velasquez ($2.249 million), lefty relievers Jose Alvarez ($1.925 million) and Adam Morgan ($1.1 million), and outfielder Aaron Altherr ($1.35 million). On Thursday, they agreed to one-year deals with reliever Hector Neris ($1.8 million) and right-hander Jerad Eickhoff ($975,000). Over the past few years, many teams have taken a “file and trial” approach to arbitration, meaning they stop negotiating once salary figures are exchanged and agree to settle the situation with a hearing in which a three-person panel of judges determines the player’s value by choosing either the player’s salary request or the team’s offer. According to the projections at MLB Trade Rumors, Nola’s annual salary is due to rise to approximately $6.6 million from $573,000 based largely on the strength of his 2018 season. He finished second in the league with a 2.37 ERA, third in WHIP (0.975) and innings (212 1/3), fourth in fielding-independent pitching (3.01), and fifth in strikeouts (224). But the only starting pitcher ever to exceed $6 million in his first year of arbitration-eligibility was lefty Dallas Keuchel, who had just won a Cy Young Award with the Houston Astros. Other arbitration-eligible pitchers who didn’t reach agreements Friday include New York Yankees ace Luis Severino and Astros right-hander Gerrit Cole.